We’re running a day late this week, but after Glastonbury & a late night Sunday night with Money in the bank we thought best to delay it. This weekend I managed to get a bit of Geeking in for a change, but there was also one heavy night of drinking. On the Friday pretty much straight after work I went to the local pub with a large group of my friends, It esculated rather quickly as always and ened up being another home at 2am job. But that’s not until after the walk home which involved falling into a river, running and hiding through long grass and jumping things but not quite making the jump. Saturday my wife went to see McBusted again, So i had the place to myself, I spent the day watching True Blood from the start again, and playing some Watch_dogs. I’ve been pretty harsh on this game on previous Geekly Reviews, due to the repetitivness of the game, However a few of the missions in Act 2 finally appear to vary a little, So I actually kind of enjoyed it for a while. I also then went onto Assassins Creed 1 again, and finally downloaded my free game from purchasing Mario Kart 8 which was Legend of Zelda Windwaker HD. Of course there is still a world cup on, So I watched the 2 games on that evening, getting incredinly involved in the Chile vs Brazil game and feeling a little gutted that Chile didn’t progress. Sunday I prepared for WWE Money in the Bank and did the standard junk food shop. Then when back just caught up on New Girl and Mindy Project with the wife. Again found time to watch some of the football. One of the WWE fans arrived and watched the game with me. A little later the 2nd WWE fan arrived so we took it upstairs and played some WWE2k14 and passed the evening by watching some memorable WWE moments and some boxing knockouts. Money in the bank was… well completely how a WWE PPV normally goes, ending with us feeling a little dissapointed. The results for Money in the Bank are up here! I’m sure that a lot of you are aware that this weekend was one of the biggest and best festivals of the year, Glastonbury. Well I was there, and now I’m knackered, I could’ve really done with an extra day off of work to catch up on some sleep. We headed down to the festival early Wednesday morning as convoy. It took us a couple of hours to get in a get set up. Once our base camp was all set up, which was by about 10am, it was time to start enjoying ourselves. On the Wednesday and Thursday only the smaller areas and stages have music going on, but there is still a hell of a lot to enjoy. We spent most of those two days wondering around finding all the little nooks of random interesting things, and sampling some of the amazing food on offer. On the Thursday evening we tried to see a couple of acts in the Park area, but it was so busy that the stage effectively got closed until some people left. Once Friday arrived it was time for the festival proper to begin. We started the day seeing a local Bristol singer song writer Gaz Brookfield. I’d only heard him a couple of times before, and he wasn’t really someone I had marked to see, but others with us had. A lot of his songs tend to be about his time in the West Country and the Bristol area, and as soon as any mention of Bristol was heard the whole crowd roared, clearly a lot of Bristolians had made the trek to see him. He was actually a real good surprise for me, and I really enjoyed his set. Then we made our way over to the dance village. Now for any of you who haven’t been to Glastonbury before, might not understand what it’s like to make these treks across the festival. 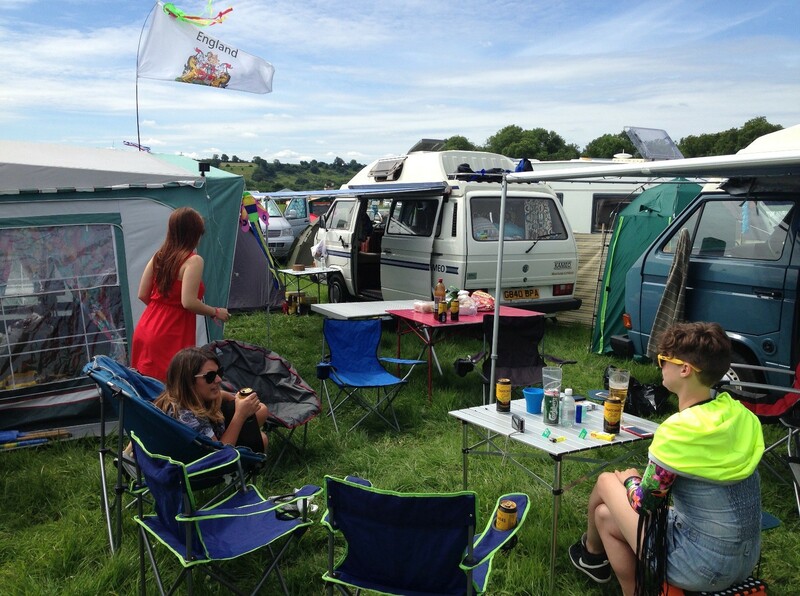 Firstly from our camping area it’s about a mile before you even get in to the festival. Then once you are there, you can easily end up walking tens of miles a day. So walking to the dance village from where we were takes about 40 minutes if not longer. When we got there were ended up seeing the Two Bears, on the sonic stage, and then headed to the BBC introducing tent to see Annie Mac and Pete Tong live on radio one. Sandwiched between that was Rudimental on the Pyramid stage, we popped over to watch a bit of it, but their set was cut short by the heaviest rain I think I’ve ever seen, oh and some Thunder and lightning. It basically caused all the main stages to turn off the power and close for about half an hour or so. 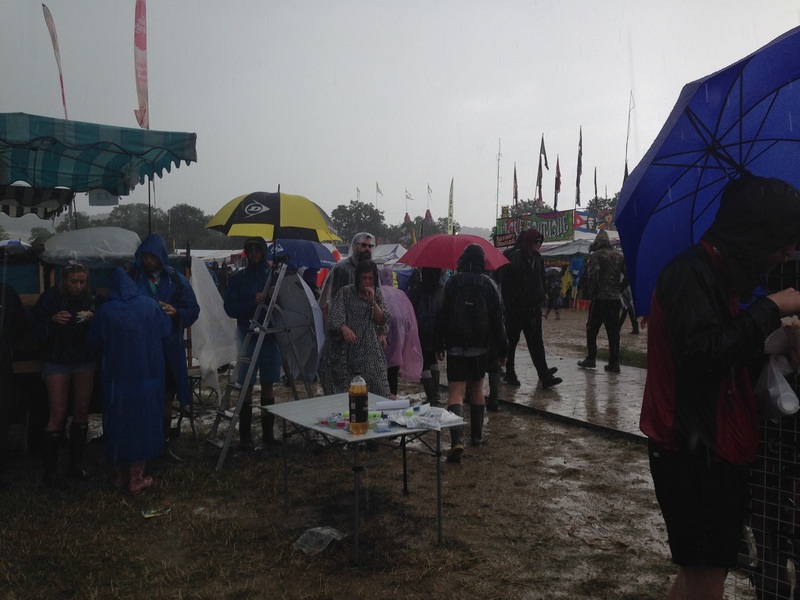 Its not Glastonbury without some rain! As Friday night descended and the weather cleared we made our way to the Other Stage to see the headline act, Skrillex. 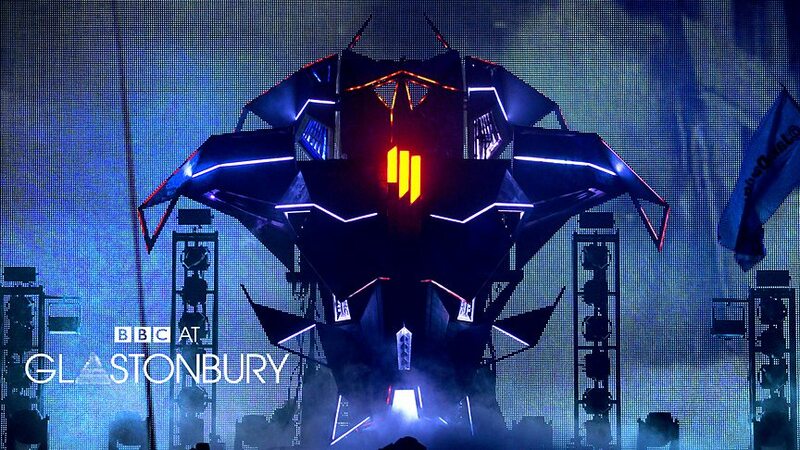 Now, Skrillex gets a lot of hate from people, and to be honest I don’t really get it. Original dubstep fans hate him for bringing the ‘brostep’ scene to the masses, others don’t like him because they don’t like dubstep, some think he just presses buttons on a computer to make his music, forgetting that he used to be in a metal band where he wrote most of the music for them. Anyway, I’m a fan of him, so was really looking forward to seeing him. Before his set he had a countdown timer, counting down from 5 minutes. As soon as the time was up, the curtain dropped to reveal A FREAKING SPACE SHIP! He was DJing in a space ship! It was insane. The crowd went absolutely mental, and everyone didn’t stop moving for the entire set. For one guy to bring a party that hard, is pretty impressive. His energy throughout the whole set was infectious, the bass was so heavy it could’ve punctured your ear drums, you just had to dance to it. It was awesome, the best live DJ set I’ve ever seen. In fact, I’m listening to again as a write this up. If you get the chance take a look at the set on Youtube or iPlayer. The rest of the night we floated from place to place, honestly I can’t quite remember what we saw. On the Saturday, not feeling to bad considering the night before, we ended up going down to the festival site late afternoon after playing some beer pong. We were kind of reserving our energy a bit because we knew Saturday was going to be a late one, seeing as my girlfriend and Dj partner – Duchess DJ’s, were taking to The Rumshack stage at 4am. Once we’d ventured down, we headed over to our usual hang out of the dance village, or Silver Hayes to give it its proper name. Whilst there we caught a bit of Foxes, Annie Mac, and a few other DJ sets. 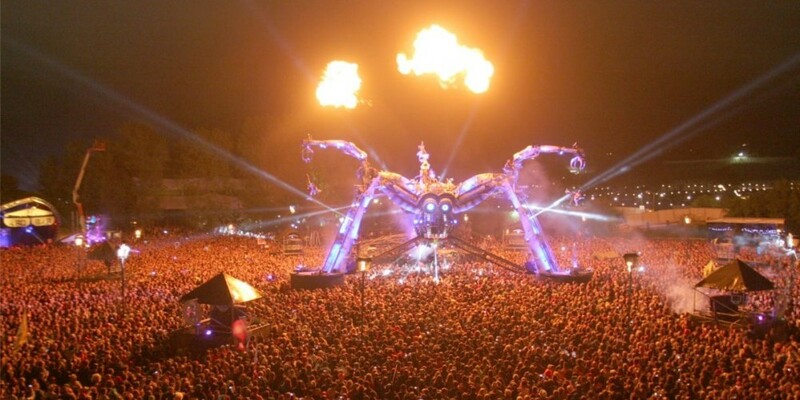 It was getting on for about midnight at this point, so we headed to Arcadia, which is basically a huge flaming spider thing, pretty impressive to look at. TEED and Disclosure were doing sets up there, but the sound was pretty awful up there, so we just chilled out for a little bit, chatting to random people. As the time pushed ever closer to 4am, our legs and feet were becoming more and more tired. Some of us were worried we might not make it until 4. But we soldiered on, and reenergized with a bit of grub. 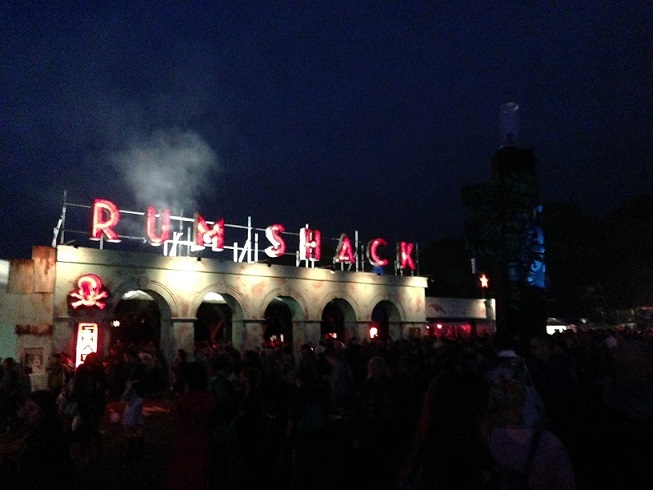 We got to the Common, where the Rumshack is, at about 3am. Meg and Frankie went off to get ready for their set, and we watched the DJ just before them. A guy called JFB, who is a ridiculously good turntablist, scratching so fast at times your eyes can hardly keep up. He would be a tough act to follow, but come 4am, Duchess took to the stage, and brought the party. All tiredness wore off, and I danced pretty much until I was dead on my feet. It was an awesome set, and I felt immensely proud to see my girlfriend up on stage rocking the place. They finished just after 5am the sun was up… It was time for bed… but as I’d mentioned it was about a mile to our camp, a walk you don’t want to be doing at that time. We didn’t get to bed until about half 6, but then probably woke up at about 9. Needless to say Sunday would be a quiet one. We ended the night pretty early, and after seeing Ellie Goulding headed back to the camp as we could barely stand any more. Monday morning, feeling like I still needed another 10 hours sleep, we got packed up and headed home. After 5 days of drinking, and partying I feel like I need a week off.